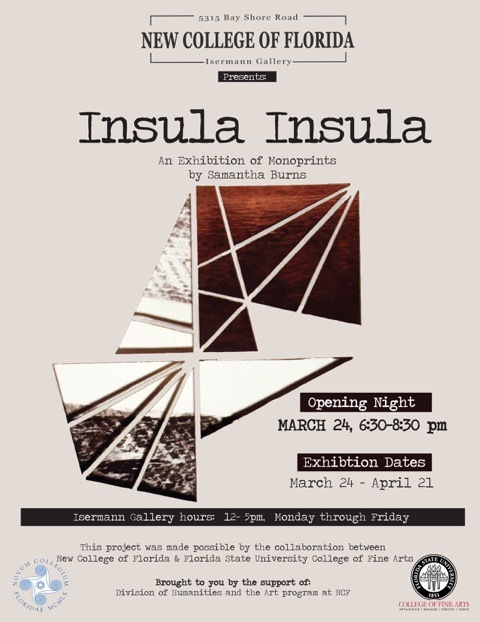 FSU Art MFA ’14 Samantha Burns is proud to present her latest body of work in the exhibit Insula Insula, at the Isermann Gallery from March 24 – April 21, 2017 in Sarasota, FL. The exhibit, sponsored by the New College of Florida’s Division of Humanities, will include a collection of monoprints by Burns, developed using traditional and new media applications within printmaking. Opening Reception is Friday, March 24, 2017 from 6:30 to 8:30 pm where the artist will be present to discuss the development of this exhibition, as well as her experiences as the New College of Florida’s 2015-16 Visiting Artist. A small departure from the time-based installations Burns typically fabricates, these pieces discuss themes rooted in her creative practice such as memory, experience, and recovery. The artworks featured in this exhibit were created by enhancing traditional, relief-printing techniques through the use of a laser cutter to cut out and etch images on paper. The three series, consisting of fifty pieces, are interconnected through their use of fragmented imagery, themes, and materials. In one series, Florida sceneries are subtly etched onto the paper accompanied by pieces of vibrant chine-collé prints providing the viewer a glance at what could have been. This exhibition was made possible through the collaboration of the New College of Florida and Florida State University College of Fine Arts, to award a recent MFA graduate and emerging artist a position to teach printmaking at NCF. As recipient of this award, Burns (FSU, MFA’14) created and taught various printmaking courses at New College while developing the bodies of work being exhibited from March 24 through April 21st. The Isermann Gallery is part of the New College of Florida’s Caples Campus in the Fine Arts Buildings. It is located at 5315 Bay Shore Road, Sarasota, FL 34234. The gallery is open Monday through Friday from 12-5pm.